We arrived at Larnaka (also spelled Larnaca) on a beautiful morning on April 5. For the most part this was a fairly nondescript seaport city of about 75,000. The locals have had little interest in preserving its interesting past but have instead preferred to build new & largely uninteresting buildings. It’s too bad we didn’t have this nice of a day in Iraklion. Before we get into Larnaka, I have to tell you about an incident at dinner during the sea day the night before. We were the first to arrive at our 8 person table for dinner, a formal night (11 nights on the cruise we have to dress for dinner) and immediately noticed that there were wine glasses at each seating. This means that a member of the ship’s staff will be at your table, a welcome occurrence because they are often interesting company, but more importantly because the ship will spring for unlimited wine for everyone at the table. Anyway, the next person to arrive was the ship staff member, a lovely Australian woman named Liza, who turned out to be in charge of acupuncture in the ship’s spa (never having been to the spa we had not met her). We had a full table (which is not usual). Because Liza was sitting next to me we got to talking. She asked where we live, & learning it was near Washington, D.C., she told me she has a niece who lives in Friendship Heights. I told her that we had worked for the federal government & she told me her niece had done so as well up until last year, so I asked what agency. She said it had to do with elections & that her niece had done something involving finances; the only other thing she remembered was that her niece’s boss was a woman. Well, I told her that would be the Federal Election Commission & that this was also the agency where I worked, and I told her a little about Tommie Duncan. She had told me her niece had only been there about 4 years, so I figured I wouldn’t know her since I retired 6 years ago, but on the assumption that some of the FEC people who might be following this blog might know her I asked her name. Her niece’s name is Claire Rajan! You could have knocked me over with a feather (for those of you not familiar with the FEC, Claire was on my staff for the last 2 or 3 years I was at the FEC). Here I was on the other side of the world, with a person from Australia randomly assigned to sit next to me, and the one person out of 300 million Americans to whom she is related worked 4 doors down from me at the FEC. These coincidences never cease to amaze me. Anyway, I was fully recovered from this by the time we left the ship in Larnaka. A ship shuttle bus took us into town & we began to look for the archeological dig at Kition (I keep confusing this name with Kitymer, where Worf’s parents were killed, if you are familiar with Star Trek). Occupied by Greeks i the 13th Century BC, Kition was colonized by Phoenicians around 800 BC and was an important seaport in the ancient world. The island was a primary source of copper (pretty important in the Bronze Age); in fact, the island’s original name, Kypros, is the source of our word copper. Really, the whole city of Larnaka is built over ancient Kition, so it can’t be excavated (& the British didn’t help by removing much of what remained above ground as “rubble” to fill marshes). But there are a few sites that have been excavated, so we went there. On this walk we saw many beautiful flowers, interesting cacti & lemon & quince trees. We came first to a spot called the Acropolis of Kition. This spot was fenced & there was no admittance, but it looked interesting with ancient ramps leading up to the top. This may have been the site of the Phoenician port, although it is far from the water today. The larger site is accessible to visitors. It is a Phoenician settlement built atop a late Bronze Age foundation. The site contains a large temple, thought to have originally been dedicated to an ancient Cypriot goddess, who was later merged into the Phoenician goddess Astarte. Astarte, in turn, may have been the basis for the Greek goddess Aphrodite, who they myths say was born here. You may recall that Aphrodite was married to the Greek god Hephaestus, who was a metalworker, and there were copper smelting buildings found by this temple. As I mentioned earlier, copper mining & smelting were important industries in Kition. I can’t tell you which rooms are which, but here are a few pictures of the structures at Kition. After Kition we walked back into town & visited the Pierides Museum. Despite its good reputation, we were disappointed. Lots of small items, some of which may have been interesting or important but you would never know due to lack of explanation. Many items were not identified & those that were had only a useless catalogue-like description you could have written yourself after looking at them (ie. “polished white finish with a handle on the left and a spout on the right”). No pictures were allowed inside. Interestingly, the museum is sponsored by Laiki, the large Cypriot bank that was closed down last week as part of the outrageous European bailout of Cyprus’s banking system, in which money was taken (really stolen) from people’s bank accounts to give to wealthy international lenders. We spoke at some length with a vendor in town, who told us about how she is not permitted (for at least another month) to draw more than $300 Euros or so out of her own bank account, and is therefore unable to pay her bills (including her child’s school tuition) or operate her business properly. Why would anyone put their money in any EU bank after they have demonstrated their willingness to appropriate parts of bank accounts for wealthy international lenders? I sure wouldn’t. We walked along the seaside promenade to the fort, first built in the Byzantine era and expanded in 1625 by the Ottomans. Then we visited Agios Lazaros, the church of St. Lazarus. This is the same Lazarus that the New Testament says Jesus raised from the dead after 4 days. It seems that things got pretty hot around Jerusalem for the early Christians, so Lazarus came to Kition and became the first bishop of Cyprus. He lived here for 30 years before he died again, and from all reports this time he stayed dead. This church was erected on what is supposed to have been his burial site, although his relics were stolen and taken to Constantinople, after which they had more adventures. It is, however, a lovely church. On the evening of April 5 we had Greek food at a special restaurant the ship set up in the Lido for 5 days. We enjoyed hummus, lamb souvlaki & baklava, among other things. Then we went to a classical guitar concert by a guitarist named Carlos Bonell, who studied with John Williams (the guitarist, not the Star Wars composer) & now teaches at the Royal College of Music in London. We were particularly interested to hear him because a few days earlier he had been seated with us at dinner & we had a very enjoyable time with him. Carlos was born in London, but both of his parents were Spanish. He is currently working with Paul McCartney (who can neither read nor write music) in composing a concerto for classical guitar & orchestra. Last year, in honor of the 50th(!) anniversary of the Beatles’ first hit record Carlos arranged 15 late Beatles tunes for classical guitar, which he recorded and played on his “Magical Mystery Guitar Tour.” One of the places he played was the church on Penny Lane where “Sir Paul” (as Carlos calls him) served as a choirboy. He said that standing in front of the church he saw the barbershop & police station mentioned in the song & was struck by how little had changed there in 50 years. To his surprise, the album was number 1 on Itunes for several days. Anyway, his playing was extraordinary, & we went back for his second concert this afternoon (April 6). He played two of his Beatles arrangements, “Classical Gas” by Mason Williams, works by Bach, Villa-Lobos, Albeniz, Vivaldi & Rodrigo (and probably some others I am not remembering). So after that we went to bed, and tomorrow we will be in Alexandria, Egypt. Right now we are told that we expect to make both of our Egyptian stops, but there are demonstrations planned in Port Said day after tomorrow, so we are keeping our fingers crossed that we will be able to dock there & take our scheduled trip to see the Pyramids. 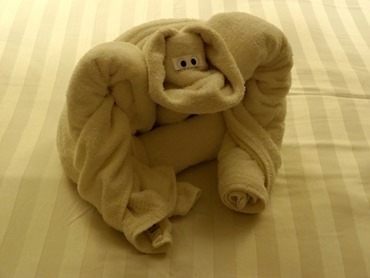 Meanwhile, here is some more fruit (& vegetable) art & some towel animals to keep you satisfied until you hear from us again (it could be awhile since we have a lot of long shore excursions coming up). This entry was posted on April 17, 2013 by Rick. It was filed under Mediterranean cruise . That’s wild about the Australian women….who would’ve thought!!! BTW Rick I love your blog just in case you were wondering!!! Very interesting and beautiful pictures !! Love you guys! Give our love to Mary Lee!!! !